Summer Time Team Building with a Twist! Our cooking classes start with as little as 8 people and can house all the way up to 25. So whether you’re on a small team or part of a larger group, we’re happy to host you and your colleagues. We have a wide variety of menu options to choose from including buckwheat crepe-based classes, homemade pasta and gluten-free options. If those don’t sound appealing you can always create a custom menu based on your specific dietary needs and desires. What sets our cooking classes apart from the rest is the fun, competitive nature we bring to the table: Iron Chef Style. Though you can absolutely opt for a more traditional type cooking class, we love the fun and unique aspect of setting it up like a friendly competition. Anja loves being a part of these style of events because “Even the most basic cook can come up with something because it’s a team exercise,” she notes. And even better? She’s seen such amazing meals created during these events that she often draws inspiration from them for her own recipes! After the 60 minutes is up, Anja and a guest judge sample the food and declare a winner. But really - when everyone gets to relax, enjoy the meal while sipping on a cocktail or glass of wine, I think everyone wins. The fun nature of this type of team building activity really “opens up conversations they’ve never had before,” Anja states. It also might bring out new sides to co-workers you might not get to see at the office! “You can get to know your team in a whole new way,” she adds. 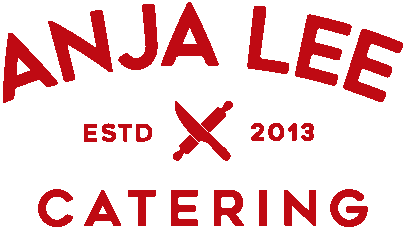 And not to worry, if this sounds up your alley and you’re not looking to book a corporate event, any group of 8 more can participate in the Iron Chef - Anja Lee style when you book a cooking class with us.